Roy Sullivan was born 1912 in Greene County in central Virginia, today home to just a shade over eighteen thousand people. He was the fourth of eleven children and lived in the Blue Ridge mountains with his family. In 1940, at the age of 28, Sullivan joined the national park’s fire patrol. He became one of three rangers to monitor the forty mile area between Waynesboro and Swift Run Gap in the southern area of the park, less than eight miles from where he grew up. In April 1942, Sullivan was in a fire tower lording over his land when a thunderstorm struck. This was a serious problem owing to the fact that the tower had no form of lightning rod installed. According to Sullivan himself, he saw lightning strike seven or eight times and the valley engulf in flames. He fled the tower, fearing what would become the inevitable. He didn’t make it far when he got hit. Besides some burns, the bolt created a half inch stripe down his right leg and caused the nail on his big toe to fall off. Considering that about eighty four people die every year from lightning strikes, many would consider Roy Sullivan lucky. For reference, about 10%-30% of people struck by lightning die from it and, according to National Geographic, the odds of a US citizen being struck by lightning during their lifetime is one in three thousand. Surprisingly high odds for something that is often used as an example of something that is exceptionally rare- “more likely to be struck by lightning than…” It should also be noted that as a park ranger in Virginia , which typically has 35-45 days per year with thunderstorms, the odds of being struck were a bit worse (or better, depending on how you want to look at it) for Mr. Sullivan than the average Joe. As for getting struck by lightning twice, in general, there’s around a one in a nine million chance of this happening. Roy Sullivan was one of those, and more. The second time Roy Sullivan was struck by lightning didn’t happen until twenty seven years after the first one, in July 1969. A summer storm hit while he was driving his truck on Skyline Drive. After several bolts around his truck, a flash came through his open window, striking him, charring his wristwatch and burning his eyebrows. While many incorrectly think it is the rubber tires that make it safe to sit in a car in a lightning storm, this isn’t the case at all. 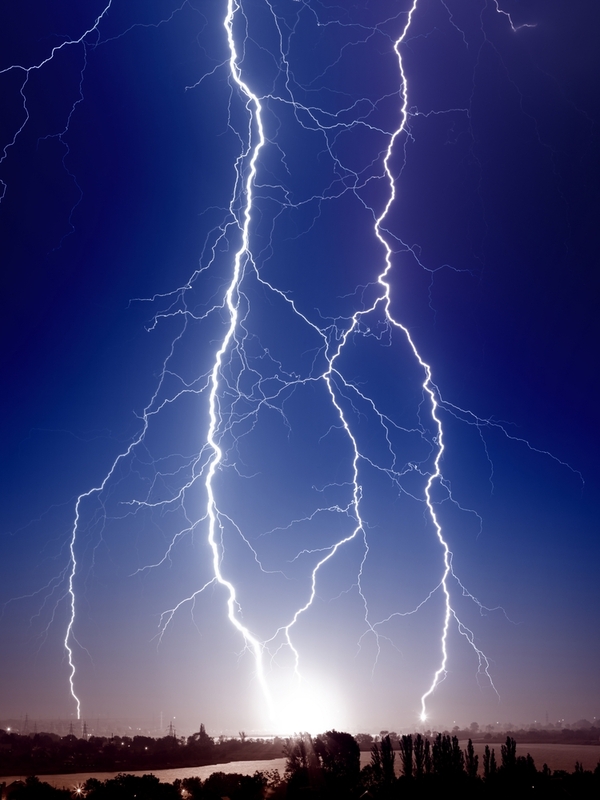 Hundreds (or thousands) of feet of air is a greater insulator than a couple inches of rubber, and lightning has no trouble with that air barrier. For your reference, air generally has a breakdown voltage of about 20-75 kV/inch. Rubber rings in at about 450-700 kV/inch. As lightning will take the easiest path to ground, you might think from those breakdown voltages it would still take the path through the 5-7 ft of air rather than through an inch or two of rubber after traveling through the very conductive metal frame of your car. However, many modern tires are designed to act as conductors, rather than insulators, so static charge doesn’t build up too much in your car. So why are cars and trucks usually safe to sit in in a thunder storm? This is because of the metal body of a vehicle and something known as the “skin effect” (more on that here). Essentially, the metal cage around you provides an easy path to ground, and as long as you’re not touching anything metal in the car, you will usually be completely fine. “Usually,” I said, because there are exceptions nicely illustrated by Mr. Sullivan. The problem Roy Sullivan had was that he had his window down. Glass is an excellent electrical insulator (breakdown voltage at 2000-3000 kv/inch- much greater than even rubber). Had the window been up, he’d have likely been fine with all the bolt’s energy discharged around him, instead of some arcing inside the truck striking him. After his vehicle and he were struck, Sullivan lost consciousness and his truck rolled into a ditch. But he survived. Again, Roy was lucky. The third time Roy was struck by lightning, he was home, tending to his garden, when a clear sky turned ominous and lightning struck a power transformer nearby. Besides the transformer being hit, Sullivan got a glancing blow to his shoulder. He was knocked down, but the damage was pretty minimal compared to the first two times. There was a gentle rain, but no thunder until just one big clap, the loudest thing I ever heard. The fire was bouncing around the inside of the station, and when my ears stopped ringing, I heard something sizzling. It was my hair on fire. Lightning strikes five, six, and seven were all accounts delivered by Roy and never submitted them to the Guinness Book of World Records for official verification as the others had been, so it’s possible he made the latter three up, as documented evidence is scant on these. The fifth one supposedly happened again while traveling in his truck in a storm. After he felt the storm had passed, he exited his truck only to be hit, singeing him pretty good and knocking him to the ground. The sixth time, he claimed he was convinced the storm was following him and out to get him. He was hit, resulting in serious burns on his chest and stomach area. At this point, we can only hope the local hospital was giving him a bit of a discount on burn treatments, whether the latter instances were really from lightning strikes or not. Even if someone doesn’t die from being struck by lightning, health issues can arise, and do in about 80% of the survivors. Severe skin burns, singed hair, and paralyzation are just some of the injuries one can suffer. Memory loss, frontal lobe damage, permanent brain injury, post-traumatic stress disorder, personality changes, and depression are other consequences from being struck by lightning that may not be as apparent right away. And, indeed, there were reports from those who knew him that Sullivan’s mental health was slipping a bit over time culminating in the events of the night of September 28, 1983. At some point in the middle of the night, with his wife sleeping next to him, Roy died from a gunshot wound to the head. Police determined it was self-inflicted. One of the biggest lightning strike disasters of all time occurred on December 24, 1971 when LANSA Flight 508 was struck by lightning. Planes are struck by lightning all the time with no problem, but this was not the case for Flight 508. It ultimately was ripped apart and crashed into the Amazon rainforest, killing 91 people. Only one person survived, a 17 year old girl who after being thrown from the plane survived the 2 mile free fall, then trekked alone through the rainforest for 10 days with no supplies. You can read more about her remarkable tale here. There is some evidence that Roy Sullivan’s death was not self-inflicted, but rather murder. Police questioned his wife (his fourth) due to the fact that his death wasn’t reported until nine am and investigators determined he had been shot at approximately three am with his wife asleep in the same room, yet the gunshot supposedly didn’t wake her. Additionally, family members claimed the couple were having marital troubles and, as reported by the Washington Post, Randy Fisher, an officer that was part of the investigation, said he found Roy “bleeding from a single .22 bullet to the head, ‘a contact wound through a pillow.’” That said, officer Philip Broadfoot of the local police stated the reason for the controversy was more because, “The family doesn’t want it to be suicide. It’s hard for people to accept. You’ve got to put a lot of faith and trust in folks responding to the scene.” Either way, it was a very sad ending.